Under call shows just contacts with phone number from your fb/hotmail/gmail/sim account. Just tap on name and dial. Write message to box then tap sms or email and tap on contact name to send sms/email. new contact selector with alphabetical key shortcuts. new check box to show all contacts if not checked same as before depend on email/sms or call. now support for multi phone numbers of one contact. just tap on right phone number and dial or send sms. new QRCode button to display contact info and QRCode image of vCard contact. just push it then tap on name you wish to share contact QRCode. Under Detail page just slide left/right screen to get your QRCode vCard. Send it via email or just tap+send to another phone. Backup your contact to your SkyDrive. Under Skydrive screen Sign In to your account. Check/Uncheck contacts and press Backup button. Note: list is filled same as in Contact screen. If public you can share with others your contacts. All cards are in .vcf (vCard) standard format. 2.0.5.2 no internet crash fix. 2.0.6.0 under Skydrive Pic check box added. If checked saves contact picture to Skydrive. Picture is located in same folder as contact with same name. Picture with Base64/Encoding is also included in (.vcf) file so it can be imported into Outlook 2007-2013. Rate Me button for rate app. Email Me button to email me directly. Now you can backup QRCode image to your Skydrive. 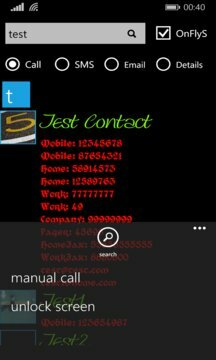 2.0.6.2 Manual Call number or/and save new number to contacts. under QRCode/Details phone / email can be updated. (just tap on email/phone number). QRCode can be saved to local Album CameraRoll. under Appointments details vCalendar QRCode generation and vCalendar Email send added. Set Search by (DisplayName, PhoneNumber,Email, FirstName, LastName, Address) so you could search contacts by this fields! Under Show check/uncheck fields (Picture,DisplayName, PhoneNumber) which to show on main page and set Picture/Text Size. Reset to Default if needed! Slider on right side added for fast scrolling (you can hide it on settings page). Customize DisplayName and Phone Number field with Color and Font. NOTE: Default is system font and color. Customize it with settings for your own needs. Under Settings BackgroundImage button added. Choose from your photo album (or take picture with camera) background image in App. You could stretch or not to fit the screen. Tap again to remove image. OnTheFlySearch checkbox added. If checked search performs on every char you typed. (slows down performance) If not just enter word to search and tap enter or icon on top. In App menu you can lock/unlock screen and get more space for contact list. Vertical/Horizontal Orientation of contacts under settings to get more space for phone num email etc. Multiple recipients for SMS/Email. Under SMS/Email on App menu select to show check boxes then check contact to send m. recipients SMS/Email. QuickSearch on main screen. Could be turned off under settings by choosing TextBox or None of above. There is also OnFlyS check box with same function as in more detailed search in App menu bar. Contacts and Appointments filter at accounts screen. Check or uncheck Contact/Appointments accounts to show in app. Screen Fix for FWVGA (854x480). 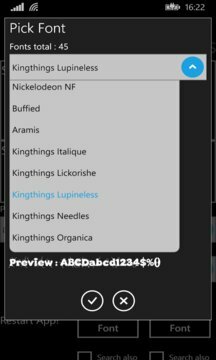 On Settings page you could now turn ON or OFF Alphabetical JumpList. On Settings page you can now choose Picture Style : Square or Circle. On OneDrive page you can now generate Excel sheet with Contacts. Upload it to OneDrive or Open Local with WP Excel. When uploading Excel sheet to OneDrive there is now also Contacts.csv in same folder.